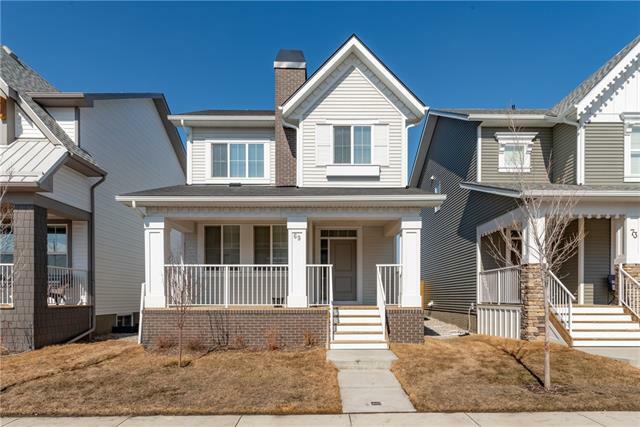 "This MOVE IN READY two-storey is beautiful inside & out. Located in Vista Crossing in Crossfield. Fantastic curb appeal, landscaped front yard and large COVERED FRONT PORCH (just under 200 Sq Ft). The main floor offers open concept living, dining and kitchen making entertaining guests easy. Kitchen boasts STAINLESS STEEL whirlpool appliances, QUARTZ counter tops and plenty of storage and counter space. A 2-piece bathroom and MUDROOM (with pantry) leading to the back deck complete this floor. The upper floor offers a master suite with full ensuite and OVERSIZED WIC. Another 4-piece bathroom separates the master from the remaining 2 bedrooms. The basement is partially finished and offers an additional family or rec space, laundry and plenty of storage space! Vista offers an excellent park, green space, fire pit and outdoor rink in the winter. Crossfield is conveniently located 15 minutes north of Airdrie and 30-40 minutes to DT Calgary. Small town living close to big City amenities."